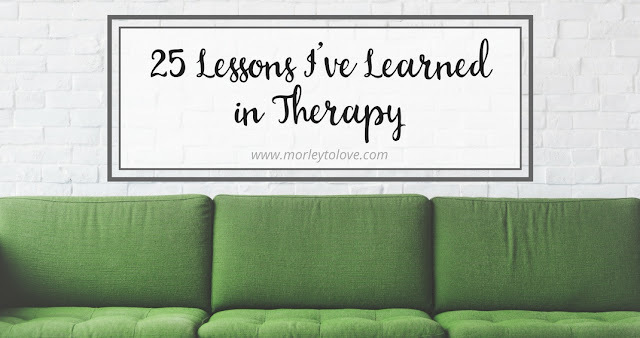 Now that I have four months of therapy under my belt, I thought I'd take a few moments and reflect on the lessons I've learned. Some of these lessons are new, and others are obvious lessons that I'm just now allowing myself to put into practice. For the sake of easy reading, I've divided them into three categories: lessons in healing, lessons in life, and lessons in coping.
. : H E A L I N G : . 1. You have to put on your own oxygen mask before you can help others. 2. You are worthy of a therapist's time. 3. Don't expect a doctor to do a therapist's job. 4. Sometimes anxiety manifests itself as anger, frustration, and/or annoyance. 5. It is possible to be clinically depressed and not know it. 6. Needing medication does not make you weak. 7. Mental illnesses are just that, illnesses. They do not make you a bad person. 8. Sometimes God answers your prayers for healing with doctors and therapists.
. : L I F E : . 9. Don't give in to self-deprecating humor. You'll start to believe it. 10. Sometimes if a person doesn't like you, you don't want them to like you. 11. Sometimes your weirdness makes you "delightfully charming." 12. Struggling doesn't make you weak. It's part of the process. 14. We are in control of very little in this world. 15. It's not normal to cry for days with anxiety about going on a vacation. 16. It's possible to make it through a holiday or vacation without an anxiety attack.
. : C O P I N G : . 17. Rocking helps anxiety, buy a rocking chair and sit in it regularly. 18. Look your anxiety in the eye and ask it "so what?" 19. Do things that make you feel uncomfortable sometimes. 20. Draw boundaries in your relationships. 23. Don't look for things to be anxious about. 24. Write your anxieties down and cross them off as you tackle them.
. : L A S T B U T N O T L E A S T : . 25. Your illness does not define you. Have you ever been in therapy? What lessons did you take away?